June 4 is Day of State Symbols in Kazakhstan. The state symbols of an independent Kazakhstan were officially approved on June 4, 1992 and starting from 2007 the day is celebrated nationwide. 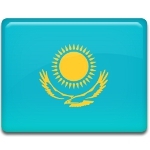 The state symbols of the Republic of Kazakhstan are state flag, emblem and anthem. The flag of Kazakhstan is a blue field with a sun, soaring steppe eagle and a national ornamental pattern called koshkar-muiz (the horns of the ram) on the hoist side colored in golden. The emblem of Kazakhstan is an image of shanuarak, the upper portion of a yurt against blue sky, irradiating in the form of sun rays uyks (or supports) set off by wings of mythical horses. The upper part of the emblem features the image of a five-pointed star and the inscription of Kazakhstan on the bottom. The elements of the emblem are colored golden. The national anthem of Kazakhstan is My Kazakhstan. It was approved on January 7, 2006. The song was written in 1956 and it was very popular. President Nursultan Nazarbayev had to make certain amendment to the text for song to become the anthem.